For other uses, see Middlemarch (disambiguation). 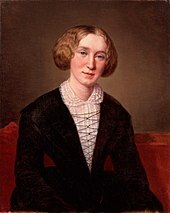 Middlemarch, A Study of Provincial Life is a novel by the English author George Eliot (Mary Anne Evans), first published in eight instalments (volumes) in 1871–1872. The novel is set in the fictitious Midlands town of Middlemarch during 1829–1832, and follows several distinct, intersecting stories with a large cast of characters. Issues include the status of women, the nature of marriage, idealism, self-interest, religion, hypocrisy, political reform, and education. Despite comic elements, Middlemarch is a work of realism encompassing historical events: the 1832 Reform Act, the beginnings of the railways, and the death of King George IV and succession of his brother, the Duke of Clarence (King William IV). It incorporates contemporary medicine and examines the reactionary views of a settled community facing unwelcome change. 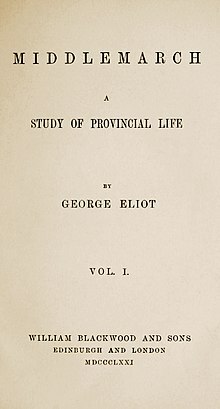 Eliot began writing the two pieces that would form Middlemarch in the years 1869–1870 and completed the novel in 1871. Although initial reviews were mixed, it is now seen widely as her best work and one of the great novels in English. Middlemarch originates in two unfinished pieces that Eliot worked on during the years 1869 and 1870: the novel "Middlemarch"[a] (which focused on the character of Lydgate) and the long story "Miss Brooke" (which focused on the character of Dorothea). The former piece is first mentioned in her journal on 1 January 1869 as one of the tasks for the coming year. In August she began writing, but progress ceased in the following month amidst a lack of confidence about it and distraction caused by the illness of George Henry Lewes's son Thornie, who was dying of tuberculosis. (Eliot had been living with Lewes since 1854 as part of an open marriage.) Following Thornie's death on 19 October 1869, all work on the novel stopped; it is uncertain at this point whether or not Eliot intended to revive it at a later date. In December she writes of having begun another story, on a subject that she had considered "ever since I began to write fiction". By the end of the month she had written a hundred pages of this story and entitled it "Miss Brooke". Although a precise date is unknown, the process of incorporating material from "Middlemarch" into the story she had been working on was ongoing by March 1871. In the process of composition, Eliot compiled a notebook of hundreds of literary quotations including excerpts from poets, historians, playwrights, philosophers, and critics in eight different languages. By May 1871, the growing length of the novel had become a concern to Eliot, as it threatened to exceed the three-volume format that was the norm in publishing. The issue was compounded by the fact that Eliot's most recent novel, Felix Holt, the Radical (1866)—also set in the same pre-Reform Bill England—had not sold well. The publisher John Blackwood, who had made a loss on acquiring the English rights to that novel, was approached by Lewes in his role as Eliot's literary agent. He suggested that the novel be brought out in eight two-monthly parts, borrowing from the method of Victor Hugo's novel Les Misérables. This was an alternative to the monthly issuing that had occurred for such longer works as David Copperfield and Vanity Fair, and it avoided the objections of Eliot herself to the cutting up of her novel into small parts. Blackwood agreed to the venture, though he acknowledged "there will be complaints of a want of the continuous interest in the story" due to the independence of each volume. The eight books duly appeared throughout 1872, the last three instalments being issued monthly. With the deaths of William Makepeace Thackeray and Charles Dickens (in 1863 and 1870, respectively), Eliot was "generally recognised as the greatest living English novelist" at the time of the novel's final publication. Middlemarch centres on the lives of the residents of Middlemarch, a fictitious Midlands town, from 1829 onwards — the years preceding the 1832 Reform Act. The narrative is variably considered to consist of three or four plots of unequal emphasis: the life of Dorothea Brooke; the career of Tertius Lydgate; the courtship of Mary Garth by Fred Vincy; and the disgrace of Nicholas Bulstrode. The two main plots are those of Dorothea and Lydgate. [b][c] Each plot happens concurrently, although Bulstrode's is centred in the later chapters. Dorothea Brooke is a 19-year-old orphan, living with her younger sister, Celia, under the guardianship of her uncle, Mr Brooke. Dorothea is an especially pious young woman, whose hobby involves the renovation of buildings belonging to the tenant farmers, though her uncle discourages her. Dorothea is courted by Sir James Chettam, a young man close to her own age, but she remains oblivious to him. She is instead attracted to The Reverend Edward Casaubon, who is 45, and Dorothea accepts his offer of marriage, despite her sister's misgivings. Chettam is meanwhile encouraged to turn his attention to Celia, who has developed an interest in him. Fred and Rosamond Vincy are the eldest children of Middlemarch's town mayor. Having never finished university, Fred is widely considered a failure and a layabout, but he allows himself to coast because he is the presumed heir of his childless uncle Mr Featherstone, an unpleasant, though rich man. 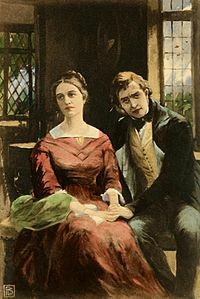 Featherstone keeps a niece of his through marriage, Mary Garth, as a companion, and though she is considered plain, Fred is in love with her and wants to marry her. On their honeymoon in Rome, Dorothea and Casaubon experience the first tensions in their marriage when Dorothea finds that her husband has no interest in involving her with his intellectual pursuits, which was her chief reason for marrying him. She meets Will Ladislaw, Casaubon's much younger cousin whom he supports financially. Ladislaw begins to feel attracted to Dorothea, though she remains oblivious, and the two become friendly. Fred develops a deep debt and finds himself unable to repay the money. Having asked Mr Garth, Mary's father, to co-sign the debt, he now tells Garth he must forfeit it. As a result, Mrs Garth's savings, which represent four years' worth of income she held in reserve for the education of her youngest son, and Mary's savings are wiped out. Consequently, Mr Garth warns Mary against ever marrying Fred. Fred comes down with an illness and is cured by Dr Tertius Lydgate, the newest doctor in Middlemarch. Lydgate has new ideas about medicine and sanitation, and believes that doctors should prescribe but not themselves dispense medicines, drawing the ire and criticism of many in the town. Rosamond Vincy, who is well-educated and seeks to make a good match, decides to marry Lydgate and uses Fred's sickness as an opportunity to get close to the doctor. Though he initially views their relationship as pure flirtation, Lydgate backs away from Rosamond after discovering that the town considers them practically engaged. However, after seeing her a final time, he breaks his resolution to abandon the relationship and the two become engaged. At roughly the same time, Casaubon, returned from Rome, suffers a heart attack. Lydgate is brought in to attend to him and informs Dorothea that the nature of Casaubon's illness and recovery is difficult to pronounce upon, that he may indeed live around 15 years if he takes it easy and ceases his studies, although it is equally possible the disease may develop rapidly, in which case death would be sudden. Meanwhile, as Fred recovers, Mr Featherstone falls ill. On his deathbed, he reveals that he has two wills and tries to get Mary to help him destroy one. Unwilling to be mixed up in the business, she refuses, and Featherstone dies with the two wills still intact. Featherstone's plan had been for £10,000 to go to Fred Vincy, but his estate and fortune instead goes to an illegitimate son of his, Joshua Rigg. In poor health, Casaubon attempts to extract from Dorothea a promise that, should he die, she will "avoid doing what I should deprecate, and apply yourself to do what I should desire." He dies before she can reply, and she later learns of a provision in his will that, if she marries Ladislaw, she will lose her inheritance. The peculiar nature of Casaubon's will leads to general suspicion that Ladislaw and Dorothea are lovers, creating awkwardness between the two. Ladislaw is secretly in love with Dorothea but keeps this to himself, having no desire to involve her in scandal or to cause her disinheritance. He remains in Middlemarch, working as a newspaper editor for Mr Brooke, who is mounting a campaign to run for Parliament on a Reform platform. Lydgate's efforts to please Rosamond soon leave him deeply in debt, and he is forced to seek help from Bulstrode. He is partly sustained through this by his friendship with Camden Farebrother. Meanwhile Fred Vincy's humiliation at being responsible for Caleb Garth's financial setbacks shocks him into reassessing his life. He resolves to train as a land agent under the forgiving Caleb. John Raffles, a mysterious man who knows of Bulstrode's shady past, appears in Middlemarch, intending to blackmail him. In his youth, the church-going Bulstrode engaged in questionable financial dealings, and his fortune is founded on his marriage to a much older, wealthy widow. Bulstrode's terror of public exposure as a hypocrite leads him to hasten the death of the mortally sick Raffles, while lending a large sum to Lydgate to allay his suspicions. However, the story of his past has already spread. Bulstrode's disgrace engulfs Lydgate, as knowledge of the loan becomes known, and he is assumed to be complicit with Bulstrode. Only Dorothea and Farebrother maintain faith in him, but Lydgate and Rosamond are nevertheless encouraged by the general opprobrium to leave Middlemarch. The disgraced and reviled Bulstrode's only consolation is that his wife stands by him as he too faces exile. When Mr Brooke's election campaign collapses, Ladislaw decides to leave the town and visits Dorothea to say his farewell. But Dorothea has also fallen in love with him, whom she had previously seen only as her husband's unfortunate relative. She renounces Casaubon's fortune and shocks her family by announcing that she will marry Ladislaw. At the same time, Fred, who has been successful in his new career, marries Mary. The "Finale" details the eventual fortunes of the main characters. Fred and Mary marry and live contentedly with their three sons. Lydgate operates a practice outside of Middlemarch but never finds fulfilment and dies at the age of 50, leaving Rosamond and four children. After he dies, Rosamond marries a wealthy physician. Ladislaw engages in public reform, and Dorothea is content as a wife and mother to their two children. Their son eventually inherits Arthur Brooke's estate. Dorothea Brooke — An intelligent, wealthy woman with great aspirations, Dorothea avoids displaying her wealth and embarks upon projects such as redesigning cottages for her uncle's tenants. She marries the elderly Reverend Edward Casaubon, with the idealistic idea of helping him with his research project, The Key to All Mythologies. However, the marriage was a mistake, as Casaubon does not take her seriously and resents her youth, enthusiasm, and energy. Her requests to assist him make it more difficult for him to conceal that his research is years out of date. Because of Casaubon's coldness during their honeymoon, Dorothea becomes friends with his relative, Will Ladislaw. Some years after Casaubon's death she falls in love with Will and marries him. Tertius Lydgate — An idealistic, talented, but naïve young doctor, and though of good birth he is relatively poor. Lydgate hopes to make great advancements in medicine through his research. However, he ends up in an unhappy marriage to Rosamond Vincy. His attempts to show that he is not answerable to any man fail and he eventually has to leave town. He ends up sacrificing all of his high ideals in order to please his wife. Rev. Edward Casaubon /kəˈsɔːbən/ — A pedantic, selfish, elderly clergyman who is obsessed with his scholarly research. Because of this his marriage to Dorothea is loveless. His unfinished book The Key to All Mythologies is intended as a monument to the tradition of Christian syncretism. However, his research is out of date because he does not read German. He is aware of this but will not admit it to anyone. Mary Garth — The practical, plain, and kind daughter of Caleb and Susan Garth, she works as Mr. Featherstone's nurse. She and Fred Vincy were childhood sweethearts, but she refuses to allow him to woo her until he shows himself willing and able to live seriously, practically, and sincerely. Arthur Brooke — The often befuddled and none-too-clever uncle of Dorothea and Celia Brooke has a reputation as the worst landlord in the county, but stands for Parliament on a Reform platform. Celia Brooke — Dorothea's younger sister is a great beauty. She is more sensual than Dorothea and does not share her sister's idealism and asceticism, and is only too happy to marry Sir James Chettam, when Dorothea rejects him. Sir James Chettam — A neighbouring landowner, Sir James is in love with Dorothea and helps her with her plans to improve conditions for the tenants. When she marries Casaubon, he marries Celia Brooke. Rosamond Vincy — Vain, beautiful, and shallow, Rosamond has a high opinion of her own charms and a low opinion of Middlemarch society. She marries Tertius Lydgate because she believes that he will raise her social standing and keep her comfortable. When her husband encounters financial difficulties, she thwarts his efforts to economise, seeing such sacrifices as beneath her and insulting. She is unable to bear the idea of losing status in Middlemarch society. Fred Vincy — Rosamond's brother, who has loved Mary Garth from childhood. His family hopes that he will advance his class standing by becoming a clergyman, but he knows that Mary will not marry him if he does so. Brought up expecting an inheritance from his uncle Mr Featherstone, he is a spendthrift. He later changes because of his love for Mary, and finds, by studying under Mary's father, a profession through which he gains Mary's respect. Will Ladislaw — A young cousin of Mr Casaubon, he has no property because his grandmother married a poor Polish musician and was disinherited. He is a man of great verve, idealism and talent but of no fixed profession. He is in love with Dorothea, but cannot marry her without her losing Mr Casaubon's property. Humphrey Cadwallader and Elinor Cadwallader — Neighbours of the Brookes. Mr Cadwallader is a Rector. Mrs Cadwallader is a pragmatic and talkative woman who comments on local affairs with wry cynicism. She disapproves of Dorothea's marriage and Mr Brooke's parliamentary endeavours. Walter Vincy and Lucy Vincy — A respectable manufacturing family. They wish their children to advance socially, and are disappointed by both Rosamond's and Fred's marriages. Mr Vincy's sister is married to Nicholas Bulstrode. Mrs Vincy was an innkeeper's daughter and her sister was the second wife of Mr. Featherstone. Caleb Garth — Mary Garth's father. He is a kind, honest, and generous businessman who is a surveyor and land agent involved in farm management. He is fond of Fred and eventually takes him under his wing. Camden Farebrother — A poor but clever vicar and amateur naturalist, he is a friend of Lydgate and Fred Vincy, and loves Mary Garth. His position improves when Dorothea appoints him to a living after Casaubon's death. Nicholas Bulstrode — A wealthy banker married to Mr Vincy's sister, Harriet, he is a pious Methodist who tries to impose his beliefs in Middlemarch society; however, he also has a sordid past which he is desperate to hide. His religion favours his personal desires, and he is devoid of sympathy for others. Peter Featherstone — An old landlord of Stone Court, he is a self-made man, who married Caleb Garth's sister and later took Mrs Vincy's sister as his second wife when his first wife died. Jane Waule — A widow and Peter Featherstone's sister, she has a son, John. Joshua Rigg Featherstone — Featherstone's illegitimate son, who appears at the reading of Featherstone's will and is given his fortune instead of Fred. He is also the stepson of John Raffles, who comes into town to visit Rigg, but instead reveals Bulstrode's past. His appearance in the novel is crucial to the plot. John Raffles — Raffles is a braggart and a bully, a humorous scoundrel in the tradition of Sir John Falstaff, and an alcoholic. But unlike Shakespeare's fat knight, Raffles is a genuinely evil man. He holds the key to Bulstrode's dark past and Lydgate's future. The action of Middlemarch takes place "between September 1829 and May 1832" or forty years prior to its publication during 1871–1872, a gap in time not so pronounced for it to be regularly labelled as a historical novel. By comparison, Walter Scott's Waverley (1814) — often regarded as the first major historical novel — takes place some sixty years before its publication. Eliot had previously written a more obviously historical novel in Romola (1862–1863), set in 15th-century Florence. The critics Kathleen Blake and Michael York Mason opine that there has been insufficient attention given to Middlemarch "as a historical novel that evokes the past in relation to the present." The critic Rosemary Ashton notes that the lack of attention to this aspect of the novel might indicate its merits in this regard: "Middlemarch is that very rare thing, a successful historical novel. In fact, it is so successful that we scarcely think of it in terms of that subgenre of fiction." For its contemporary readership, the present "was the passage of the Second Reform Act in 1867"; the agitation for the Reform Act of 1832 and its turbulent passage through the two Houses of Parliament, which provide the basic structure of the novel, would have been considered the past. Although rarely categorised as a historical novel, Middlemarch's attention to historical detail has been noticed by critics; in his 1873 review, Henry James recognised that Eliot's "purpose was to be a generous rural historian". Elsewhere, Eliot has been described as adopting "the role of imaginative historian, even scientific investigator in Middlemarch, and her narrator, as conscious "of the historiographical questions involved in writing a social and political history of provincial life"; this narrator compares the novel to "a work of the ancient Greek historian Herodotus", who is often described as "The Father of History". Eliot's novel is set in the fictional town of Middlemarch, North Loamshire, which is probably based on Coventry, in the county of Warwickshire, where she had lived prior to moving to London. Like Coventry, Middlemarch is described as being a silk-ribbon manufacturing town. The subtitle of the novel—"A Study of Provincial Life"—has been viewed as significant, with one critic viewing the unity of Middlemarch as being achieved through "the fusion of the two senses of 'provincial'": that is on the one hand the geographical, meaning "all parts of the country except the capital"; and on the other hand, a person who is "unsophisticated" or "narrow-minded". Carolyn Steedman considers Eliot's emphasis on provincialism in Middlemarch in relation to Matthew Arnold's discussion of social class in England in his series of essays Culture and Anarchy, published in 1869, around the time Eliot began working on the stories which would become Middlemarch. In that series, Arnold classifies British society in terms of the Barbarians (aristocrats and landed gentry), Philistines (urban middle class) and Populace (the working class), and Steedman suggests that Middlemarch "is a portrait of Philistine Provincialism". It is worth noting that Eliot went to London, as her heroine Dorothea does at the end of the book, where Eliot achieved fame way beyond most women of her time, in contrast to Dorothea who takes on the role of nurturing Will and her family. Eliot was rejected by her family once she had established her common-law relationship with Lewes, and "their profound disapproval prevented her ever going home again" and she did not visit Coventry during her last visit to the Midlands in 1855. Central to Middlemarch is the idea that Dorothea Brooke cannot hope to achieve the heroic stature of a figure like Saint Theresa, because Eliot's heroine lives at the wrong time: "amidst the conditions of an imperfect social state, in which great feelings will often take the aspect of error, and great faith the aspect of illusion". Antigone, a figure from Greek mythology best known from Sophocles' play Antigone, is given in the "Finale" as a further example of a heroic woman. Literary critic Kathleen Blake notes that George Eliot emphasises Saint Theresa's "very concrete accomplishment, the reform of a religious order", rather than the fact that she was a Christian mystic. A frequent criticism by feminist critics has been that Dorothea is not only less heroic than Saint Theresa and Antigone, but also George Eliot herself; in response, both Ruth Yeazell and Kathleen Blake chide these critics for "expecting literary pictures of a strong woman succeeding in a period [around 1830] that did not make them likely in life". Eliot has also been criticised more widely for ending the novel with Dorothea marrying a man, Will Ladislaw, so clearly her inferior. The author Henry James describes Ladislaw as a dilettante and feels that he "has not the concentrated fervour essential in the man chosen by so nobly strenuous a heroine." 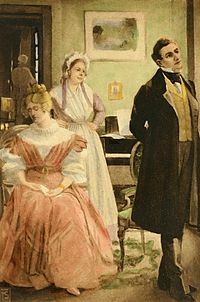 Marriage is one of the major themes in Middlemarch as, according to the critic Francis George Steiner, "both principal plots [those of Dorothea and Lydgate] are case studies of unsuccessful marriage". Within this account is the suggestion that the lives of Dorothea and Lydgate are unfulfilled because of these "disastrous marriages". This is arguably more the case for Lydgate than for Dorothea, who obtains a second chance through her eventual marriage to Will Ladislaw; however, a favourable interpretation of this marriage is dependent upon the character of Ladislaw himself, whom numerous critics have viewed as Dorothea's inferior. In addition to these marriages there is the "meaningless and blissful" marriage of Dorothea's sister Celia Brooke to Sir James Chettam and, more significantly, Fred Vincy's courting of Mary Garth; in this latter story, Mary Garth will not accept Fred until he abandons the Church and settles on a more suitable career. In this regard, Fred resembles Henry Fielding's character Tom Jones, both characters being moulded into a good husband by the love they give to and receive from a woman. Dorothea is a Saint Theresa, born in the wrong century, in provincial Middlemarch, who mistakes in her idealistic ardor, "a poor dry mummified pedant […] as a sort of angel of vocation". Middlemarch is, in part, a Bildungsroman focusing on the psychological or moral growth of the protagonist, in which Dorothea "blindly gropes forward, making mistakes in her sometimes foolish, often egotistical, but also admirably idealistic attempt to find a role" or vocation, with which to fulfil her nature. Lydgate is equally mistaken in his choice of a marriage partner, as his idea of a perfect wife is someone "who can sing and play the piano and provide a soft cushion for her husband to rest after work". So he marries Rosamond Vincy, "the woman in the novel who most contrasts with Dorothea," with the result that he "deteriorates from ardent researcher to fashionable doctor in London." The Examiner, The Spectator and Athenaeum reviewed each of the eight books that comprise Middlemarch as they were published from December 1871 to December 1872; such reviews hence speculated as to the eventual direction of the plot and responded accordingly. Contemporary response to the novel was mixed. Writing as it was being published, the Spectator reviewer R. H. Hutton criticised the work for what he perceived as its melancholic quality. Athenaeum, reviewing after its "serialisation", found the work overwrought and thought that it would have benefited from hastier composition. [d] Blackwood's Edinburgh Magazine's reviewer W. L. Collins noted the work's most forceful impression to be its ability make the reader sympathise with the characters. Edith Simcox of Academy offered high praises, hailing the work as a landmark event in fiction owing to the originality of its form; she rated it first amongst Eliot's œuvre, which meant it "has scarcely a superior and very few equals in the whole wide range of English fiction". "What do I think of 'Middlemarch'?" What do I think of glory – except that in a few instances this "mortal has already put on immortality." George Eliot was one. The mysteries of human nature surpass the "mysteries of redemption," for the infinite we only suppose, while we see the finite. The author Henry James offered a mixed opinion on Middlemarch, opining that it is "at once one of the strongest and one of the weakest of English novels". His greatest criticism ("the only eminent failure in the book") was towards the character of Ladislaw, who he felt to be an insubstantial hero-figure against that of Lydgate. The scenes between Lydgate and Rosamond he especially praised, on account of their psychological depth — he doubted whether there were any scenes "more powerfully real... [or] intelligent" in all English fiction. Thérèse Bentzon, writing for the Revue des deux Mondes, was highly critical of Middlemarch. Although finding merit in certain scenes and qualities, Bentzon faulted the structure of the novel, describing it as being "made up of a succession of unconnected chapters, following each other at random.... The final effect is one of an incoherence which nothing can justify." In her view, Eliot's prioritisation of "observation rather than imagination... inexorable analysis rather than sensibility, passion or fantasy" means that she should not be held amongst the first ranks of novelists. The German philosopher Friedrich Nietzsche, who read Middlemarch through a translation owned by his mother and sister, derided the novel for construing suffering as a means of expiating the debt of sin, which he found characteristic of "little moralistic females à la Eliot." Despite the divided contemporary response, Middlemarch gained immediate admirers: in 1873, the poet Emily Dickinson expressed high praise for the novel, exclaiming in a letter to a friend: "What do I think of Middlemarch? What do I think of glory." The immediate success of Middlemarch may have been proportioned rather to the author's reputation than to its intrinsic merits. ...[the novel] seems to fall short of the great masterpieces which imply a closer contact with the world of realities and less preoccupation with certain speculative doctrines. In separate centuries, Florence Nightingale and Kate Millett both remarked on the eventual subordination of Dorothea's own dreams to those of her admirer, Ladislaw. 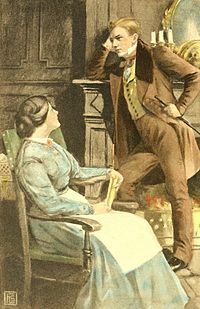 In the first half of the 20th century, Middlemarch continued to provoke contrasting responses; while her father Leslie Stephen dismissed the novel in 1902, Virginia Woolf described it in 1919 as "the magnificent book that, with all its imperfections, is one of the few English novels written for grown-up people." However, Woolf was "virtually unique” among the modernists in her unstinting praise for Middlemarch, and the novel also remained overlooked by the reading public of the time. The necessary part of great intellectual powers in such a success as Middlemarch is obvious... the sheer informedness about society, its mechanisms, the ways in which people of different classes live... a novelist whose genius manifests itself in a profound analysis of the individual. Leavis' appraisal of it has been hailed as the beginning of a critical consensus that still exists towards the novel, in which it is recognised not only as Eliot's finest work, but as one of the greatest novels in English. V. S. Pritchett, in The Living Novel, two years earlier, in 1946 had written that "No Victorian novel approaches Middlemarch in its width of reference, its intellectual power, or the imperturbable spaciousness of its narrative.... I doubt if any Victorian novelist has as much to teach the modern novelists as George Eliot.... No writer has ever represented the ambiguities of moral choice so fully". In the 21st century, the novel continues to be held in high regard. The novelists Martin Amis and Julian Barnes have both described it as probably the greatest novel in the English language,[e] and today Middlemarch is frequently taught in university courses. In 2013, the then British Education Secretary Michael Gove referred to Middlemarch in a speech, suggesting its superiority to Stephenie Meyer's vampire novel Twilight. Gove's comments led to debate concerning the teaching of Middlemarch in Britain,[f] including the question of when novels like Middlemarch ought to be read,[g] and the role of canonical texts in teaching. The novel has remained a favourite with readers and appears highly in rankings of reader preferences: in 2003 it was listed at number 27 on the BBC's The Big Read, and in 2007 it was No. 10 in "The 10 Greatest Books of All Time", based on a ballot of 125 selected writers. In 2015, in a BBC Culture poll of book critics outside the UK, the novel was ranked at number one in "The 100 greatest British novels". Middlemarch has been adapted numerous times for television and the theatre. In 1968 it was adapted into a BBC-produced TV mini-series of the same name, directed by Joan Craft and starring Michele Dotrice. In 1994 it was again adapted by the BBC as a television series of the same name, directed by Anthony Page and with a screenplay by Andrew Davies. This series was a critical and financial success and revived public interest in the adaptation of classics. In 2013 there was a stage adaptation, as well as an Orange Tree Theatre Repertory production, which was adapted and directed by Geoffrey Beevers into three plays: "Dorothea's Story", "The Doctor's Story", and "Fred & Mary." The novel has never been adapted for film, although such a project was considered by the English director Sam Mendes. The opera Middlemarch in Spring by Allen Shearer on a libretto by Claudia Stevens has a cast of six characters and treats only the central plot line, the story of Dorothea Brooke; it was given its premiere production in San Francisco in 2015. In 2017, a modern adaptation of the novel, Middlemarch: The Series, aired on YouTube as a video blog.. The opening lyrics of the song How Soon is Now? by The Smiths were adapted from Middlemarch ("I am the son and heir, of nothing in particular"). ^ The title of this earlier work is put in quotes in order to distinguish it from the eventual novel of the same title. ^ Ladislaw is described by Henry James as the novel's "hero". ^ Steiner remarks that the Dorothea and Lydgate plots "are equally important if not more significant in the overall structure [of the novel]". ^ The novel was completed before being published in eight instalments (volumes). ^ Jones, Nelson. "In a political arena largely devoid of obvious talent Michael Gove is a star turn". newstatesman.com. New Statesman. Retrieved 1 April 2015. Middlemarch, by contrast [to Twilight], though 150 years older, features a free-thinking, active and educated heroine. If we want our daughters to aspire, which provides the better role model? ^ Berry, Jill (15 May 2013). "Michael Gove is wrong: why shouldn't students read Twilight?". The Guardian. Retrieved 1 April 2015. I think she would be better starting with Silas Marner or The Mill on the Floss and leaving Middlemarch until she had greater life experience and emotional maturity. ^ F. R. Leavis, The Great Tradition. New York: George W. Stewart, 1948. ^ a b Swinden (1972), p. 12. ^ Ashton (1983), p. 300. ^ Ashton (1983), p. 295. ^ Swinden (1972), p. 29. ^ Ashton (1983), pp. 311–12. ^ M.a.13–14, from the collection of the Folger Shakespeare Library; . ^ a b Beaty (1960), p. 43. ^ Ashton (1983), p. 287. ^ Ashton (1994), p. viii. ^ Beaty (1960), pp. 43–44. ^ Swinden (1972), p. 30. ^ Beaty (1960), p. 55. ^ Ashton (1994), p. 1. ^ Steiner (1955), p. 263. ^ a b James (1873). ^ a b Steiner (1955), p. 264. ^ Steiner (1955), p. 266. ^ a b c d e f g Steedman (2001). ^ a b Kathleen Blake, "Middlemarch and the Woman Question", p. 309. ^ Kathleen Blake, "Middlemarch and the Woman Question", Nineteenth–century Fiction, Vol. 31, No. 3 (December, 1976), ", p. 310. ^ a b Wynne–Davies (1990), p. 719. ^ The Chambers Dictionary (13th edition), London,: Chambers Harrap, 2014. ^ Blake (1976), p. 288. ^ Blake (1976), p. 310. ^ Blake (1976), pp. 306–310. ^ Henry James, A book review of Middlemarch, Galaxy, March, 1873. ^ Ashton (1994), p. 8. ^ Blake (1976), pp. 306–9. ^ Steiner (1955), pp. 265–6. ^ Blake (1976), p. 293. ^ a b Ashton (1994), p. 4. ^ Swinden (1972), p. 13. ^ Swinden (1972), p. 14. ^ Hutton, R. H. "Review of Middlemarch", Spectator, 1 June 1872. ^ Athenaeum, 7 December 1872. ^ Collins, W. L. Blackwood's Edinburgh Magazine, December 1872. ^ Simcox, Edith (January 1873). "Review of Middlemarch". Academy. (Reprinted from Swinden, Patrick, ed. , pp. 41–47). ^ Linscott, Robert N., 1959. Selected Poems and Letters of Emily Dickinson, Anchor Books, Random House, New York, p. 242. ^ Bentzon, TH (February 1873). "Le Roman de la vie de province en angleterre". Revue des deux Mondes (103). (Reprinted from Swinden, Patrick, ed. , pp. 56–60). ^ Megan Armknecht. "The Weight of 'Glory': Emily Dickinson, George Eliot, and Women's Issues in Middlemarch." Criterion 9.1 (2016): 35–46. ^ Eleanor Elson Heginbotham. "'What do I think of glory -': Dickinson's Eliot and Middlemarch." Emily Dickinson Journal 21.2 (2012): 20–36. ^ Stephen, Leslie (1902). George Eliot (2010 ed.). Cambridge: Cambridge University Press. pp. 172–184. ^ Millet (1972), Sexual Politics, Nightingale quoted in George Eliot and Gender, Kate Flint, 2001. ^ Virginia Woolf, The Common Reader, 1925, p. 175. ^ Chase (1991), p. 92. ^ a b Swinden (1972), p. 22. ^ Quoted in Karen Chase, George Eliot, Middlemarch, p. 94. ^ "What does it mean to be an educated person?" (Speech). gov.uk. Department for Education and The Rt Hon Michael Gove. Retrieved 1 April 2015. ^ Grossman, Lev (15 January 2007). "The 10 Greatest Books of All Time". Time. Retrieved 12 May 2010. ^ Ciabattari, Jane (7 December 2015). "The 100 greatest British novels". Time. Retrieved 8 December 2015. ^ Roberts, Jerry (2009). Encyclopedia of television film directors. Lanham, Md. : Scarecrow Press. p. 105. ISBN 9780810863781. ^ "Middlemarch". Screenonline. British Film Institute. Retrieved 21 March 2015. ^ "What's On: Middlemarch: 'Dorothea's Story'". OrangeTreeTheater.co.uk. ^ Irvine, Lindesay (23 April 2007). "Mendes to direct mini-Middlemarch". The Guardian. Retrieved 5 July 2015. ^ "Opera review: 'Middlemarch in Spring' is a sunny romp". sfchronicle.com. Retrieved 2 April 2018. ^ Mead, Rebecca (July 14, 2017). ""Middlemarch" Gets Winningly Adapted as a Web Series". The New Yorker. Ashton, Rosemary (1983). George Eliot. Oxford: Oxford University Press. ISBN 0-19-287627-9. Ashton, Rosemary (1994). "Introduction". In Eliot, George. Middlemarch. Penguin. ISBN 978-0-141-43954-9. Beaty, Jerome (1960). Middlemarch from Notebook to Novel: A Study of George Eliot's Creative Method. Urbana: University of Illinois Press. Beaty, Jerome (December 1957). "History by Indirection: The Era of Reform in "Middlemarch"". Victorian Studies. 1 (2): 173–179. ISSN 0042-5222. Chase, Karen (1991). Eliot: Middlemarch (Landmarks of World Literature). Cambridge: Cambridge University Press. ISBN 0521359155. Steedman, Carolyn (Summer 2001). "Going to Middlemarch: History and the Novel". Michigan Quarterly Review. XL (3): n.p. Steiner, F George (1955). "A Preface to Middlemarch". Nineteenth-Century Fiction. 9 (4). Swinden, Patrick, ed. (1972). George Eliot: Middlemarch: A Casebook. London: Macmillan. ISBN 0-333-02119-3. Tillotson, Geoffrey, ed. (1951). Criticism and the Nineteenth Century Novel. London. Trainini, Marco, Vendetta, tienimi compagnia. Due vendicatori in "Middlemarch" di George Eliot e "Anna Karenina" di Lev Tolstoj, Milano, Arcipelago Edizioni, 2012, ISBN 8876954759. Wynne–Davies, Marion, ed. (1990). The Bloomsbury Guide to English Literature. New Yor k: Prentice Hall. Adam, Ian, ed. (1975). This Particular Web: essays on Middlemarch. Toronto: University of Toronto Press. Bloom, Harold, ed. (2009). George Eliot. Philadelphia, PA: Chelsea. ISBN 9781438116006. Carroll, David, ed. (1971). George Eliot: The Critical Heritage. London: Routledge & K Paul. ISBN 0-7100-6936-7. Chase, Karen, ed. (2006). Middlemarch in the Twenty-First Century. Oxford: Oxford University Press. Daiches, David (1963). George Eliot: Middlemarch. London: Arnold. Dentith, Simon (1986). George Eliot. Brighton, Sussex: Harvester Press. ISBN 0-7108-0588-8. Garrett, Peter K (1980). The Victorian Multiplot Novel: Studies in Dialogical Form. New Haven: Yale University Press. ISBN 0-300-02403-7. Graver, Suzanne (1984). George Eliot and Community: A Study in Social Theory and Fictional Form. Berkeley: University of California Press. ISBN 0-520-04802-4. Harvey, W. J. (1961). The Art of George Eliot. London: Chatto & Windus. Harvey, W. J. (1967). "Criticism of the Novel: Contemporary Reception". In Hardy, Barbara Nathan. Middlemarch: Critical Approaches to the Novel (2013 ed.). London: Bloomsbury. ISBN 9781472536143. Kettle, Arnold (1951). An Introduction to the English Novel, Volume I: To George Eliot. London: Hutchinson. Neale, Catherine (1989). George Eliot, Middlemarch. London: Penguin Books. ISBN 0-14-077173-5. Bentzon, TH. Revue des Deux Mondes, February 1873. Broome, F. N. The Times, 7 March 1873. Collins, W. L. Blackwood's Edinburgh Magazine, December 1872. Colvin, Sidney, Fortnightly Review, 1 January 1873. Hutton, R. H. Spectator, 1 June 1872. Hutton, R. H. British Quarterly Review, 1 April 1873. James, Henry, "George Eliot's Middlemarch", Galaxy, March 1873. Simcox, Edith, Academy, 1 January 1873. Woolf, Virginia, "George Eliot", The Times Literary Supplement, 20 November 1919. "Middlemarch, a study of provincial life". 1 (first ed.) , "Middlemarch". 2 , "Middlemarch". 3 , "Middlemarch". 4 . This page was last edited on 11 April 2019, at 20:38 (UTC).